As the armed camp that Europe had become by the summer of 1914 approached the point of explosion, the United States was markedly unprepared for any role that a European holocaust might create for the New World. Nor was there any widespread agitation to alter that situation, for despite the nation's increased involvement in world affairs, most Americans looked to the tactic of the ostrich to keep them out of the trouble. Americans, President Woodrow Wilson would admonish once war came, should remain "impartial in thought as well as in action." Although the Navy, the nation's first line of defense, was the world's third largest, the Army was woefully inadequate for coping with anything much more complex than domestic disturbances or border defense. In striking contrast to 1.5 million trained men available in France and more than 2 million in Germany, the U.S. Army was short even the 100,000-man strength that Congress had authorized in I9o2. Within the Army high command the contest of authority between the General Staff and the powerful bureau chiefs still went on, for all Elihu Root's reforms, and argument persisted over Emory Upton's rejection of the militia system in favor of the concept of an expansible army. The event that set off war in Europe came in late June at Sarajevo where a fanatical Serbian nationalist assassinated the heir to the Austro-Hungarian throne. In other times and under different conditions, this act might not have been enough to catapult the world into the most widespread and costly conflict man had yet known, one that eventually would put under arms sixty-five million men from thirty countries representing every continent, and one that would involve sea battles around the globe and major land campaigns not only in Europe but in parts of Africa and Asia Minor. Yet as matters stood that summer of 1914, Europe was a tinderbox awaiting a spark. The situation was, in the words of President Wilson's personal adviser, Col. Edward M. House, "militarism run stark mad." European nationalism had much to do with it. In Germany, a newly united nation forged from a loose-knit confederation of quarreling states no longer had the strong guiding hand of its able creator, Chancellor Otto von Bismarck, but instead had the chauvinistic direction of Wilhelm II, the kaiser. In Italy, also only recently united, vacillation and indecision reigned. In Russia, center of bellicose pan-Slavism, an autocratic czar already was feeling the pressure of people's revolt. In the Balkans, various minorities, particularly the Serbs, were challenging the patchwork amalgamation that was the Austro-Hungarian empire. At the same time the industrial revolution, with its attendant commercial expansion, had prompted Germany to seek entry into the colonial system that long had been the province of France and Britain. As the Germans built the navy that was essential to their ambition, Britain's age-old supremacy of the seas was challenged. Germany's rise also threatened France on the ground, already tangibly demonstrated in the war of I870-7I, which produced in the French a lasting bitterness and such a burning desire to regain the lost provinces of Alsace and Lorraine that many saw a war of irredentism as inevitable. The Germans continued to expand their military machine in keeping with their ever-growing aspirations, and as the French followed suit, an arms race of frightening proportions ensued. Meanwhile, the nations banded together in alliances designed to offset one another. There was at first the Triple Alliance composed of Germany, Austria, and Italy. On the other side, the Entente Cordiale between Britain and France gradually merged with the Dual Alliance of France and Russia to become the Triple Entente. With the defection of Italy, Germany and Austria became the Central Powers, which Bulgaria and Turkey eventually joined. The Triple Entente became, with the addition of Italy, the nucleus of the Allied Powers. Despite some halfhearted efforts to localize the dispute over the assassinated prince, the fact that Russia backed Serbia and the kaiser promised Austria full support meant that the only real question was the date when the war was to begin. The answer to that came on July 28 when Austria declared war on Serbia. In view of the entangling alliances and the bulging arsenals, entry of all the major powers into the conflict was all but preordained. ponderous masses could fully mobilize, then to shift forces rapidly to the east and destroy the Russians at will. Schlieffen's successor, Helmuth von Moltke, failed to heed this proviso. Moltke eliminated the invasion of the Netherlands, thus confining the German right wing to a narrow fortified corridor on either side of the Belgian city of Liege. Wary of the theory of giving ground in Alsace-Lorraine, he shifted troops from the right to strengthen the defense on the left. Similarly worried about the strength of the German forces assigned to contain the Russians, Moltke withdrew four and a half corps from the right wing to move to the east. These vagaries almost did in the Schlieffen plan, yet such surprise did the maneuver achieve that by late August French and British were in full retreat, the threat to Paris so real that the French Government abandoned the city. At that point Moltke again wavered, for word came that the Russians had mobilized far faster than expected and had begun to attack. Under pressure from the kaiser, Moltke again violated Schlieffen's dictum, pulling out two more corps from his right wing. In an effort to compensate for this diminution by reducing the depth of the envelopment, he ordered the tip of the scythe to pass east rather than west of Paris. The two corps that Moltke withdrew had no effect in the east, since they arrived only after the Germans already had repelled the Russians in the battles of Tannenberg and the Masurian Lakes. 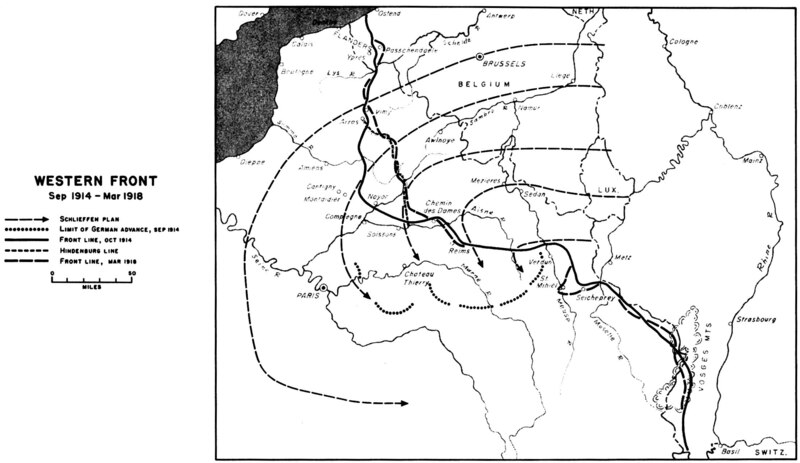 Had Moltke retained them, they might not have been enough to carry the Schlieffen plan through to victory; but since their departure was what had prompted Moltke to alter the scope of the envelopment, their presence would have sharply changed the nature of what followed, the "Miracle of the Marne." action afforded time for main British and French forces to turn, halt the Germans at the Marne River east of Paris, and drive them back to the Aisne River, forty miles to the north. As stalemate developed along the Aisne, each side tried to envelop the northern flank of the other in successive battles that by October had extended the opposing lines all the way to the Belgian coast. 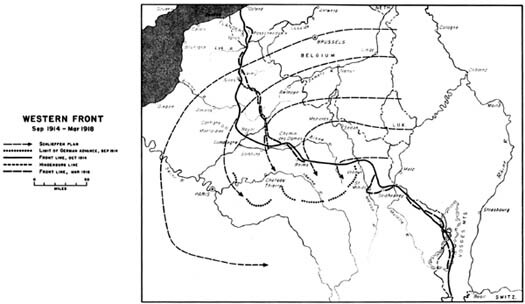 The year would end with the Germans in control of most of Belgium and of the rich mining and industrial provinces of northern France, while the Allies, to their good fortune, managed to hold on to most of the Channel ports, which were vital if the British were to supply their troops on the Continent and if the Germans were to be denied critical bases for operations against the Royal Navy. Hurting from unexpectedly brutal losses and stunned at the indecision of the first four months of warfare, Allied and German armies alike went to ground. The landscape from Switzerland to the sea soon was scarred with opposing systems of zigzag, timber-revetted trenches, fronted by tangles of barbed wire sometimes more than 150 feet deep and featured here and there by covered dugouts providing shelter for troops and horses and by observation posts in log bunkers or concrete turrets. Out beyond the trenches and the barbed wire was a muddy desert called no man's land where artillery fire had eliminated habitation and vegetation alike, where men in nighttime listening posts strained to hear what the enemy was about, and where rival patrols clashed. It would eventually be apparent to both sides that they had miscalculated, that the newly developed machine gun and improved indirect fire artillery had bolstered not the offense but the defense, and that which had been presaged� but ignored�in the U.S. Civil War and in the Russo-Japanese War had come to be. The spade had become the sine qua non of the battlefield, lessening the applicability of such principles of war as maneuver, economy of force, surprise, and making critical the principle of mass. Masses of men�nearly 2 million Germans, 3 million Allied troops; masses of artillery�barrages lasted days and even weeks before an offensive; and masses of casualties�British and French in 1915 lost 1.5 million men killed, wounded, and missing. Yet through it all the opposing lines stood much as they had at the start. For more than two years they would vary less than ten miles in either direction. vast armies for munitions, equipment, and supplies, the nations harnessed their mines, factories, and railroads to war production, levied high income taxes, froze wages and prices, rationed food and other commodities. On the battlefield, commanders persisted in a vain hope that somehow the stalemate might be ended and breakthrough and exploitation achieved. Although the Germans spent much of their effort in 1915 in a futile campaign for quick victory against the Russians, it was they who first came close to a breakthrough on the Western Front. They did so in April with a greenish mist of chlorine gas released from thousands of canisters against a French colonial division on the British sector of the front. The colonials broke, but the Germans were unprepared to exploit the advantage. The first use of poison gas thus was a strategic blunder wasting total surprise for nothing more than local gains. The British similarly blundered the next year when they also introduced a new weapon prematurely. This was the tank, an ungainly, ponderous offspring of a marriage of armor with the caterpillar tractor; it owed its name to British attempts to deceive the Germans that the vehicle was a water storage device. In the first commitment in September 1916, 34 tanks helped British infantry advance a painful mile and a half. There would be other attacks in later months involving tanks in strengths close to 500, but the critical element of surprise already had passed. Tanks later would prove sufficient to achieve the penetration everybody sought, but they were too slow and too subject to mechanical failure to fill the old role of horse cavalry as the tool of exploitation. For all the lack of decision, both poison gas and the tank soon were established weapons, although the Germans were slow to accept the tank. Another weapon, meanwhile, found full acceptance on both sides: the airplane, frail forerunner of modern tactical and strategic bombers. Used at first primarily for reconnaissance, then as a counterreconnaissance weapon to fight the enemy's planes, and finally as an offensive weapon to attack ground troops, before the war ended aircraft engaged in strategic missions against railroads, factories, and cities, presaging the mass destruction that was to follow in another great war. many neutral ships were sunk. The first American vessel to be involved was the merchant ship Gulflight, struck by a torpedo on the first day of May, but the event with sharpest impact on public opinion followed a week later when a submarine off the coast of Ireland sank the British liner Lusitania, with the loss of 1,198 lives, including 128 Americans. The sinking of the Lusitania shocked an American public that, while unable to follow the President's dictum on impartiality of thought, had nevertheless displayed up to this point little desire to become directly involved in Europe's bloodbath. Although most Americans had from the first resented the submarine campaign, Britain too was violating the freedom of the seas with a blockade not only of Germany but of neutral European nations as well. This had raised the question of whether the acts of both sides were not equally reprehensible; but the heavy loss of life in the sinking of the Lusitania invoked fresh ire against the Germans. Membership in patriotic organizations flourished, and voices advocating preparedness found new listeners. Among the voices were those of Elihu Root, ax-President Theodore Roosevelt, and former Secretary of War Henry L. Stimson. Another was that of General Wood, whose term as the Army's Chief of Staff had expired just over a year after President Wilson and his peace-oriented administration had come to office. Following a practice he had introduced while Chief of Staff of conducting summer camps where college students paying their own way could receive military training, Wood lent his support to a similar four-week camp for business and professional men at Plattsburg Barracks, New York. Known as the "Plattsburg idea," its success justified opening other camps, assuring a relatively small but influential cadre possessing basic military skills and imbued with enthusiasm for preparedness. Yet these were voices of a heavily industrialized and articulate east. Few like them were to be heard from the rural south, the west, or a strongly isolationist midwest, where heavy settlements of German-Americans (called by some, derisively, "hyphenated Americans") detected in the talk of preparedness a heavy leaning toward the nation's historic Anglo-Saxon ties. There was in the country, too, a strong tide of outright pacifism, which possessed an eloquent spokesman in Wilson's Secretary of State, William Jennings Bryan. dissatisfied with the German reply and determined to insist on the right of neutrals to engage in commerce on the high seas, insisted on a second and stronger note. The Secretary resigned. Although sinkings by submarine continued through the summer of 1915, Wilson's persistent protest at last produced an apparent diplomatic victory when in September the Germans promised that passenger liners would be sunk only after warning and with proper safeguards for passengers' lives. Decelerating their campaign, the Germans actually acted less in response to American protests than to a realization that they lacked enough submarines to achieve victory by that means. American commerce with Europe meanwhile continued, particularly in munitions, but because of the British blockade almost all was with the Allied nations. The British intercepted ships carrying foodstuffs to Germany and held them until their cargoes rotted. Just after mid-1915 they put even cotton on a long list of contraband and blacklisted any U.S. firm suspected of trading with the Central Powers. These were deliberate and painful affronts, but so profitable was the munitions trade that only the southern states, hurt by the loss of markets for cotton, raised loud protest. In October 1915 President Wilson repealed a ban earlier imposed on loans to belligerents, thereby further stimulating trade with the Allies. While Americans as a whole remained opposed to entering the war, their sympathy for the Allied cause grew. A combination of Allied propaganda and German ineptitude was largely responsible. The propagandists were careful to insure that nobody forgot the German violation of Belgian neutrality, the ordeal of "Little Belgium." Stories of babies mutilated and women violated by German soldiers were rampant. The French executed nine women as spies during the war, but it was the death of a British nurse, Edith Cavell, at the hands of the Germans that the world heard about and remembered. Clumsy German efforts at propaganda in the United States backfired when two military attaches were discovered financing espionage and sabotage. The Germans did their cause no further good when one of their submarines in October I9I6 surfaced in Newport Harbor, sent an officer ashore to deliver a letter for the German ambassador, then submerged and sank nine Allied ships close off the New England coast. also urged widespread military training for civilians, lest some day the nation be faced with "putting raw levies of inexperienced men onto the modern field of battle." Still upholding the cause of freedom of the seas, he refused to go along with congressmen who sought to forbid Americans to travel on armed merchant ships. Wilson nevertheless continued to demonstrate a fervent hope for neutrality. A submarine attack in March on the French steamer Sussex with Americans aboard convinced the President's adviser, Colonel House, and his new Secretary of State, Robert Lansing, that the nation should sever diplomatic relations with Germany, a course that a fiery speech of self-justification by the German chancellor in the Reichstag and a cynical reply to an American note of protest did nothing to discourage. Wilson instead went only so far as to dispatch what amounted to an ultimatum, demanding that the Germans cease the submarine war against passenger and merchant vessels or face severance of relations with the United States. While questioning the American failure to deal as sternly with the British blockade and rejecting the charge of unrestricted submarine warfare, Germany again agreed to conform to American demands for prior warning and for protecting the lives of passengers. Wilson, in turn, saw that unless something could be done about the British blockade the German vow probably would be short-lived. When a protest to the British availed nothing, the President offered the services of the United States to negotiate a peace. That brought little positive response from either side. Some of the President's growing sympathy for the cause of preparedness could be traced to increasing concern on the part of members of his administration, most notably the Secretary of War, Lindley M. Garrison. As an annex to the Secretary's annual report in September 1915, Garrison had submitted a study prepared by the General Staff entitled, "A Proper Military Policy for the United States." Like proposals for reform advanced earlier by Stimson and Wood, the new study turned away from the Uptonian idea of an expansible Regular Army, which Root had favored, to the more traditional American concept of a citizen army as the keystone of an adequate defense force. Garrison proposed more than doubling the Regular Army, increasing federal support for the National Guard, and creating a new 4oo,ooo-man volunteer force to be called the Continental Army, a trained reserve under federal control as opposed to the state control of the Guard. Although Wilson refused to accept more than a small increase in the Regular Army, he approved the concept of a Continental Army. Garrison's proposal drew support, too, in the Senate, but not enough to overcome adamant opposition in the House of Representatives from strong supporters of the National Guard. Influential congressmen countered with a bill requiring increased federal responsibility for the Guard, acceptance of federal standards, and agreement by the Guard to respond to a Presidential call to service. Under pressure from these congressmen, Wilson switched his support to the Congressional plan. This, among other issues, prompted Garrison to resign. There the matter might have bogged down had not Pancho Villa shot up Columbus, New Mexico. Facing pressing requirements for the National Guard on the Mexican border, the two halls of Congress at last compromised, incorporating the concept of the citizen army as the foundation of the American military establishment but not in the form of a Continental Army. They sought instead to make the National Guard the nucleus of the citizen force. Passed in May and signed into law the next month, the bill was known as the National Defense Act of 1916. It provided for an army in no way comparable to those of the European combatants and produced cries of outrage from those still subscribing to the Uptonian doctrine. It also contained a severe restriction inserted by opponents of a strong General Staff, sharply limiting the number of officers who could be detailed to serve on the staff at the same time in or near Washington. The bill represented nevertheless the most comprehensive military legislation yet enacted by the U.S. Congress. The National Defense Act of 1916 authorized an increase in the peacetime strength of the Regular Army over a period of five years to 175,000 men and a wartime strength of close to 300,000. Bolstered by federal funds and federal-stipulated organization and standards of training, the National Guard was to be increased more than fourfold to a strength of over 400,000 and obligated to respond to the call of the President. The act also established both an Officers' and an Enlisted Reserve Corps and a Volunteer Army to be raised only in time of war. Additional officers were to be trained in colleges and universities under a Reserve Officers' Training Corps program. commission composed of the secretaries of the principal government departments, and charged with the mission of studying economic mobilization. The administration furthered the preparedness program by creating a U.S. Shipping Board to regulate sea transport while developing a naval auxiliary fleet and a merchant marine. As Wilson, through the fall of 1916, waged a campaign for reselection on a peace platform, the war on the Western Front remained a stalemate despite two of history's greatest and bloodiest battles. In a switch of main effort from Eastern to Western Front, Moltke's successor as Chief of the General Staff, Erich van Falkenhayn, chose the fortress town of Verdun, which he deemed of immense moral and psychological significance to France, for massive attack in a campaign designed to bleed France white. There followed the Battle of the Somme in which the British with French support attacked in quest of breakthrough and victory. Neither achieved much more than to run up the casualty total: 460,000 French at Verdun, 300,000 German; 614,000 Allied troops on the Somme, 650,000 German. The appalling carnage of these battles brought the relief of Falkenhayn, replaced by the heroes of the Eastern Front, Paul van Hindenburg as Chief of the General Staff, and Erich Ludendorff as First Quartermaster General, his deputy, although it was Ludendorff rather than the aging Hindenburg who dominated in this command arrangement. It also wrote the end to the field career of the French Commander in Chief, Field Marshal Joffre. In England, a government fell. On the Eastern Front, the Russians had rallied after giving up Poland to the Germans and struck back with a major offensive against the Austrians that carried almost to the passes leading through the Carpathian Mountains. It was the greatest Russian victory of the war, but it cost a million men and left the poorly armed, poorly equipped Russian soldier ready to embrace revolution. That year, too, Italians and Austrians ground each other down along the Isonzo in northeastern Italy, while an adventure in peripheral warfare, launched the preceding year at the instigation of Winston Churchill, First Lord of the Admiralty, ended indecisively in evacuation of the Gallipoli peninsula. Indecisive too was the war's greatest sea battle, when a cornered German surface fleet ventured out of the Baltic to meet the British Fleet in the Battle of Jutland, then withdrew to the corner for the rest of the war, but only after inflicting more losses than it received. During the last three months of 1916, the German submarine campaign again mounted in intensity. Each month the British lost 176,000 tons of shipping. Counting Allied and neutral shipping, the losses averaged 192,000 tons a month, a shocking increase over the previous year that reflected a continuing growth of the U-boat fleet. As a new year of war opened, German leaders decided that they had lost so many men at Verdun and on the Somme that they would have to assume the defensive on the Western Front; their only hope of quick victory lay with the submarines, of which they now had close to zoo. By operating an unrestricted campaign against all shipping, whatever the nationality, in-waters off the British Isles and France, the Germans believed they could defeat the Allies within six months. While they recognized the strong risk of bringing the United States into the war by this tactic, they believed they could starve the Allies into submission before the Americans could raise, train, and deploy an Army. The German ambassador in Washington continued to encourage Wilson to pursue his campaign for peace even as the Germans made their U-boats ready. On January 31, 1917, Germany informed the U.S. Government and other neutrals that beginning the next day U-boats would sink all vessels, neutral and Allied alike, without warning. While the world waited to learn the American reaction, President Wilson searched for some alternative to war. Three days later, still groping desperately for a path to peace, he went before the Congress, not to ask a declaration of war, but to announce a break in diplomatic relations. This step, Wilson hoped, would be enough to turn the Germans from their new course. Wilson could not know it at the time but an intelligence intercept already had placed in British hands a German telegram that, when released, would remove any doubt as to German intentions toward the United States. This message was sent in January from the German Foreign Secretary, Arthur Zimmermann, to the German ambassador to Mexico, proposing that in the event of war with the United States, Germany and Mexico conclude an alliance, with the adherence of Japan. In exchange for Mexico's taking up arms against the United States, Germany would provide generous financial assistance. Victory achieved, Mexico was to regain her lost territory of Texas, New Mexico, and Arizona. Cognizant of the impact the message was bound to have on the United States, the British were nevertheless slow to release it; they had to devise a method to assure the Americans of its authenticity while concealing from the Germans that they had broken the German diplomatic code. On February 23, just over a month after intercepting the telegram, the British turned over a copy to the American ambassador in London. When President Wilson received the news, he was angered but still unprepared to accept it as cause for war. In releasing the message to the press, he had in mind not inciting the nation to war but instead moving Congress to pass a bill authorizing the arming of American merchant ships, most of which were standing idle in American ports because of the submarine menace. As with the break in diplomatic relations, this, the President hoped, would so impress the Germans that they would abandon their unrestricted submarine campaign. Although Congress and most of the nation were shocked by revelation of the Zimmermann message, their hopes for neutrality shattered, pacifists and pro-Germans countered with a roar of disbelief that the message was authentic. Zimmermann himself silenced them when in Berlin he admitted having sent the telegram. In the next few weeks, four more American ships fell victim to German U-boats. Fifteen Americans died. At last convinced that the step was inevitable, the President went before Congress late on April 2 to ask for a declaration of war. Four days later, on April 6, 1917, the United States declared war on Germany. The United States entered the war even as Allied fortunes were approaching their nadir. In Russia in March a spontaneous revolution had erupted, prompting the czar to abdicate and initiating a struggle for power between moderate Socialists and hard-core revolutionaries, the Bolsheviks. The moderates won, formed a provisional government, and vowed to continue the war, a development that made going to war more palatable to many Americans, since the overthrow of the old dynastic-imperial system gave logic to a Wilsonian phrase that this was a war "to make the world safe for democracy." Central Powers launched a counteroffensive in July close behind a short-lived Russian offensive, Russian units, riven by revolutionary cells, collapsed, with soldiers deserting by the tens of thousands. The way was prepared for the Bolsheviks to seize power in the October Revolution. The new government under Lenin and Trotsky sued for peace. On the Western Front the year's operations began with great expectations on the Allied side as a new French commander, General Robert Nivelle, prepared a grandiose, end-the-war offensive. With support from a converging British attack from the north, Nivelle planned to send four French armies to cut in behind a great bulge in the line between Soissons and Arras. Unfortunately, Nivelle was too open with his preparations. The Germans moved first, pulling back from the bulge to a previously prepared position which the Allies would name the Hindenburg Line. In the process they laid waste to the land behind them, and in occupying a shorter line gained 13 divisions for their reserve. In exchange for the usual minor gains, the British incurred 84,000 casualties, the French 187,000. The worst was still to come. Mutiny broke out in one French regiment and spread swiftly through 54 divisions. The government relieved Nivelle, putting in his place to restore the Army's morale and discipline Henri Philippe Petain, who had emerged as the hero of the earlier battle for Verdun. With the French temporarily hors de combat, the British took up the struggle with a giant offensive in Flanders. First came a limited objective attack to straighten a minor bulge in the line known as the Messines Ridge. Working like moles, the British dug five miles of underground tunnels, laid a million pounds of explosives, then literally blew up the Messines Ridge. With some 20,000 Germans killed or wounded in one blow, the British took the ridge; but when they launched their main offensive a few miles to the north, breakthrough was as elusive as ever. In a battle that persisted into late fall�Passchendaele, they called it, after a ridge that was the first objective�British casualties totaled 245,000, German half that number. More disastrous still were the results of an Austrian offensive launched with German assistance in Italy in the fall. In what became known as the Battle of Caporetto, the Italians in one blow lost 305,000 men; 275,000 of them surrendered as the Army fell back a hundred miles in panic. British and French divisions had to be rushed to Italy to keep the Italians in the war. command. The Allies created a Supreme War Council with both political and military representation from all the Allied nations, a step toward an over-all command, but only a step. Despite the seriousness of the crises on land, the most portentous of all as the United States entered the war was the crisis at sea. In February 1917 alone, German U-boats had sunk 781,000 tons of Allied and neutral shipping, and the British were predicting a loss in April of almost 900,000 tons. At this rate, the British reckoned, the Germans soon would force them out of the war; by October 1917, the end would be in sight. Although far from ready for war, the U.S. Navy fortunately was in a position to take immediate steps to aid the Allies. An emissary from Washington, Rear Adm. William S. Sims, helped to convince the British Admiralty to employ a new tactic to counter the rampaging submarines, a system of convoys whereby destroyers and other warships escorted groups of merchant vessels across the Atlantic. By early May, 6 U.S. destroyers had begun to participate in this system, and before the summer was out the number would grow to 37, while 5 U.S. battleships were operating in European waters. The convoy system did not defeat the submarine, but it was effective enough to break the crisis. During the last half of 1917 total ship sinkings declined steadily; in December less than 400,000 tons of shipping was lost. In the meantime, the United States had joined Britain in a massive shipbuilding program. The U.S. Army was in no position to make its weight felt immediately. Counting that part of the National Guard federalized for duty on the Mexican border, the Army numbered only 210,000 men with an additional 97,000 Guardsmen still in state service. Not a single unit of divisional size existed and so hobbled by the restriction written into the National Defense Act was the General Staff that only 19 officers were on duty in the headquarters in Washington. Although the experience in Mexico had given the little Army some seasoning, the main result of that involvement had been to point up shortages in equipment and other deficiencies. Except for 890,000 Springfield rifles, the Army's arsenal was nearly bare. concept received neither general nor official support. Starting with the President's war message to Congress, the intent was to send ground troops to Europe and to do all possible to defeat the German empire and end the war. Congress, the President, the government moved swiftly in that direction. The House of Representatives authorized a $7 billion bond issue; to build up and manage the merchant marine, the President created the Emergency Fleet Corporation; the Treasury Department opened a drive to float a $2 billion Liberty Loan. The Army General Staff, meanwhile, quickly decided that to bolster Allied morale a division should be shipped as promptly as possible to France as tangible evidence that the United States intended to fight. Forming a division required collecting as a nucleus four infantry regiments from the Mexican border, building them up to strength with men from other regiments and with recruits, and calling Reserve officers to fill out the staffs. By mid-June the 1st Infantry Division had begun to embark amid dockside confusion not unlike that in the Spanish-American War. Not only did the men lack many of their weapons but a large number had never even heard of some of them. Yet the pertinent fact was that a division was on the way to provide a much-needed boost for the war-weary Allied nations. On the Fourth of July, a battalion of the 16th Infantry marched through Paris to French cheers of near delirium, but it would be months before the 1st Division would be sufficiently trained to participate in the war even on a quiet sector of the front. To command the American Expeditionary Forces, President Wilson chose the man with command experience in Mexico, John J. Pershing, even though Pershing was junior to five other major generals in the Army. Within three weeks of the appointment, Pershing was on his way to France to survey the situation and furnish the War Department with an estimate of the forces that would have to be provided. He was present for the I6th Infantry's parade on the Fourth of July and participated in a ceremony at the tomb of General Lafayette, where a Quartermaster colonel�not Pershing, as many would long believe�uttered the words, "Lafayette, we are here." tions and family obligations, all males between the ages of 21 and 30 had to register. These ages later were extended from 18 to 45. The Selective Service Act also established the broad outlines of the Army's structure. There were to be three increments: (I) the Regular Army, to be raised immediately to the full wartime strength of 286,000 authorized in the National Defense Act of 1916; (2) the National Guard, also to be expanded immediately to the authorized strength of approximately 450,000; and (3) a National Army (the National Defense Act had called it a Volunteer Army), to be created in two increments of 500,000 men each at such time as the President should determine. Much of the identity of these three segments eventually would be lost as recruits and draftees alike were absorbed in all units, so that in mid-IgI8 the War Department would change the designation of all land forces to one "United States Army." The original segment to which regiments, brigades, and divisions belonged nevertheless continued to be apparent from numerical designations. For the Regular Army, for example, divisions were numbered up to 25, while numbers 26 through 75 were reserved for the National Guard and higher numbers for divisions of the National Army. Just how large an army the United States was to raise depended in large measure on the situation in Europe and on General Pershing's recommendations from his vantage point there. Soon after Pershing's arrival in France, he called for approximately a million men to be sent to France before the end of 1918. This was the smallest number, Pershing noted, that would afford an independent fighting force, a full field army of 20 divisions and necessary supporting troops. This number, Pershing warned, probably would constitute only a start. The War Department in turn translated Pershing's recommendation into a plan to send instead by the end of 1918 30 divisions with supporting services, a total of 1,372,000 men; but so disastrous were the developments in Europe in succeeding months�the Nivelle offensive, Passchendaele, Caporetto, the Russian Revolution�that Pershing felt impelled to revise his estimate. In June 1918, he would ask for 3,000,000 men with 66 divisions to be in France by May 1919. This figure he quickly raised to an estimate of 80 divisions by April 1919, followed shortly by a request for 100 divisions by July of the same year. in turn, an increase in the original program of 30 divisions by the end of 1918, raising the goal to 52 divisions. Part of the War Department's concern was based on the size of the U.S. division�28,000 men�almost double that of Allied and German divisions, which meant in numbers of men that 100 U.S. divisions were the equivalent of almost 200 Allied divisions. This size was a result of one of Pershing's early recommendations, which, along with advice of military missions sent from France and Britain, prompted radical changes in organization of the U.S. infantry division. The need, as Pershing saw it, was for a division large enough to provide immense striking and staying power, one larger in size than most army corps of the Civil War. As determined by the War Department, the division was to be organized in 2 infantry brigades of 2 regiments each, a field artillery brigade with 1 heavy and 2 light regiments, a regiment of combat engineers, 3 machine gun battalions, plus signal, medical, and other supporting troops. As the war proceeded, the Army actually would reach a peak strength of 3,685,458. This included 62 divisions, 43 of which were sent overseas. On this basis, when the war came to an end, the Army was running close to the projected goal of 52 divisions to be in France by the end of 1918. How fast the Army could expand at the start depended in large measure on the availability of housing and of arms, equipment, and supplies. New Regular regiments and small units were organized immediately, using existing housing facilities, while the new National Guard formations were called in two increments and housed in tent camps, mainly in warmer southern states. A1though over nine million men registered for the draft in June, the first would be called to fill the divisions of the National Army only in September after a priority building program could provide the first of the vast new cantonments that would be required. A special Cantonment Division of the Quartermaster Corps worked with a civilian Committee on Emergency Construction to provide these facilities. by agencies of the Army and Navy, to establish production priorities, to create new plans and convert existing plants to priority uses, and to co-ordinate the activities of various civilian war agencies. Despite these efforts, the demand for arms was so immense and immediate and the time required for contracts to be let and industry to retool so lengthy that the Army for a long time would have to train with obsolete and even wooden guns and in the end would have to depend heavily on Allied manufacture. The one weapon providing no particular problem was the rifle. To add to already existing stocks, the Army's own arsenals increased production of Springfields, while plants that had been filling Allied orders modified the British Lee-Enfield rifle to take U.S. ammunition for use by U.S. troops. All American units reaching France during the first year had to be equipped with Allied machine guns and automatic rifles, but new and excellent Browning machine guns and automatic rifles began coming off U.S. production lines in volume by mid-1918. Of some 2,250 artillery pieces used by American forces in France, only a hundred were of U.S. manufacture. Similarly an embryonic U.S. Tank Corps used French tanks, and in some instances British and French tank battalions supported U.S. troops. The Air Section that expanded rapidly to 11,425 flying officers, of whom 5,000 reached France, also had to depend primarily on planes provided by the Allies. The United States did produce a good 12-cylinder Liberty airplane engine, and a few U.S. planes saw service in latter weeks of the war. The record of U.S. industry was somewhat better in terms of the soldier's personal needs, including his food. The Army worked closely with a War Food Administration to avoid the food scandals of earlier wars. Inductions had to be slowed briefly until sufficient uniforms could be accumulated, and shortages in some items persisted, but as a result less of industry's failures than of a cumbersome Quartermaster contracting system, which was eventually corrected. The Army in any case made extensive purchases abroad but mainly in bulky items to relieve the burden on transatlantic shipping�horses, coal, lumber for overseas camps, and a few textile items like blankets. Providing officers for the new divisions was another factor affecting the speed of the Army's expansion, for at the start the Army had only 9,000 officers against an immediate requirement of 200,000. Although the General Staff at first contemplated scattering the officers and noncommissioned officers of the Regular Army to form cadres for the National Army, in keeping with Uptonian doctrine, it early became apparent that the small number of Regulars would be submerged and lost in the sea of conscripts. This was one of the factors influencing the General Staff's decision to form a division of Regulars for early shipment to France. Eschewing the obvious though questionable expedient of appointing officers directly from civilian life, the Army provided direct commissions only for specialists like doctors and those uniquely qualified by civilian experience for the technical services. As a start, the Army conducted sixteen Officers' Training Camps for civilians and reservists on the order of the old "Plattsburg idea"; but in the main the Army drew its officers from the ranks of qualified enlisted men in the Regular Army, Prom the Reserve Officers' Training Corps and a Student Army Training Corps in colleges and universities, and in the largest numbers of all from Officers' Training Camps in division cantonments and later eight consolidated Officers' Training Schools. Officer candidates were admitted to these schools only after careful screening and then were given three months of intensive training. The 60 percent who made the grade were commissioned in the new National Army. Called in some circles "go day wonders," these officers nevertheless provided the Army with a leadership far surpassing that of the average new officer in any previous war. inexperienced, that General Pershing set up a thorough training course for all divisions once they arrived in France. Conducted with British and French assistance, Pershing's program was so lengthy as to provoke impatience on the part of the Allies and criticism on the part of many American officers. Getting the troops to their training centers, then to ports of embarkation, and finally across the Atlantic was such a mammoth undertaking and had to be executed on such an emergency basis that confusion and mismanagement could hardly have been unexpected. To co-ordinate rail transportation, the government established a Railway War Board, which later became the Railroad Administration, but so congested did the railroads become that the government eventually seized and ran them through the Railroad Administration. The Shipping Board that had been created close on adoption of the National Defense Act of 1916 had had more time for preparation, but shipping nevertheless remained a critical item and ports often were glutted with supplies. The government cut imports drastically to conserve shipping, established a mass construction program of standardized cargo vessels, and seized interned German vessels and a few others of foreign registry; but British vessels still had to handle much of the traffic. As expansion and overseas deployment proceeded, the unprecedented and in some cases overwhelming demands of the situation had an inevitable impact on many of the Army's historic institutions. The most marked and at the same time of the most import for the future was on the organization of the General Staff and the authority of the Chief of Staff. The office of the Chief of Staff had yet to find an assertive incumbent until early in March 1918, when the War Department brought back from France Pershing's artillery commander, Maj. Gen. Peyton C. March. In recalling March, the Secretary of War, Newton D. Baker, had reorganization of the General Staff specifically in mind, for a recent Senate investigation of quartermaster, supply, and transportation problems had focused attention on deficiencies that the early months of expansion had revealed. In the Overman Act, passed by the Congress in May 1918, which granted the President broad authority to reorganize executive agencies during the war emergency, March obtained the tool needed to establish at long last General Staff authority over the heretofore powerful bureau chiefs. Given the additional authority of the rank of full general, March decreed that these chiefs were subordinate to the General Staff and were to report to the Secretary of War only through the Chief of Staff. Drastically reorganizing the General Staff, March created four main divisions: Operations; Military Intelligence; Purchase, Storage, and Traffic; and War Plans. The titles fairly well explained the functions, except that Operations and War Plans shared the functions of the former War College Division and that Purchase, Storage, and Traffic provided the Army for the first time a central control over logistics. Under this reorganization, the total military and civilian strength of the General Staff increased to just over a thousand. The Chief of Staff by law (Act of May 12, 1917) takes rank and precedence over all officers of the Army, and by virtue of that position and by authority of and in the name of the Secretary of War he issues such orders as will insure that the policies of the War Department are harmoniously executed by the several corps, bureaus, and other agencies of the Military Establishment and that the Army program is carried out speedily and efficiently. of the field commander in France, General Pershing, who had been promoted to four-star rank ahead of March. Pershing had gone to France with an almost total authority to do the job as he saw it, and, despite technical subordination to March, Pershing resisted any effort by the Chief of Staff to assert authority over his command. The Secretary of War on a number of occasions had to act as arbiter between the two and, in matters related to the American Expeditionary Forces, usually acceded to Pershing's will rather than March's. The final evolvement of the Chief of Staff as the incontestably supreme military chief of the Army would have to await Pershing's return and his assumption of the job himself, yet Peyton C. March stood, along with Root, as a primary architect of the position.